Our Guides were developed in collaboration with countless veteran patients who have shared their wisdom with all our members since 2010. Credit is given where the contributors are known. They are a collection of essential information everyone living with cluster headache should know. 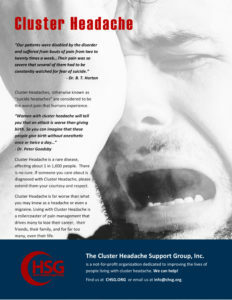 Get your cluster headache "basic training" right here! We cover everything from getting an accurate diagnosis, identifying and avoiding your triggers, plus the most common treatment options to consider. Feeling overwhelmed? Wondering how you can possibly enjoy life with cluster headache? Explore these tips from some of our most experienced members. Everything you ever wanted to know about US disability laws, insurance, and employment rights. Don't live in the US? We are actively looking for members from all parts of the world who can accurately and articulately share disability information from their home country. Contact us if you'd like to volunteer! Oxygen is a safe, effective abortive for many people living with cluster headache. Much to our frustration, it isn't always easy to get access when we need it. Discover the wisdom of our veteran patients as they share their strategies for access, affordability, and usage tips.